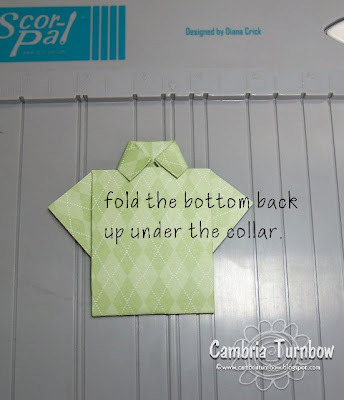 I saw this cute card my friend JulieHrr made with money over on her blog and it reminded me of some cards I made a few years ago with that shirt fold. Then.... I got to thinking and spotted the awesome Palette O' Prints pad sitting on a pile on my desk. I hope the ric rak isn't too girly, but I just couldn't help myself... it matched so well. The black piece is a scrap I also found on my messy desk that was ran through the Cuttlebug with the swirls embossing folder. The ribbon is May Arts (startlitstudio), the mini brads are from Queen & Co. Everything else is from Stampin'Up! Stamps: Stamp of Authenticity, All Year Cheer II, All in a Row. Okay... now I'm going to show you how I made the shirt. 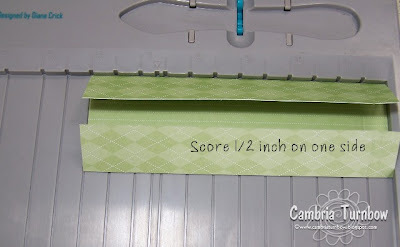 SUPER EASY... especially if you own a Scor-Pal! ;) I've been asked by some of you how I like the Scor-Pal, and I tell you, I honestly LOVE it! It's light weight, easy to store (I keep it right at my feet slid in between my trash can and my desk) accurate, and best of all, I don't lose the little tool because it fits in top all snug and neat. Oh, and you can't push too hard and rip your paper either! I really can't say enough about it, and that Diana... she's da bomb. 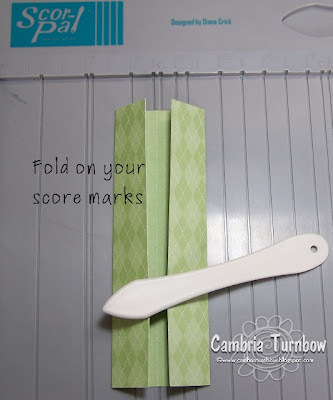 :) If you are a scoring nut like me... you NEED a Scor-Pal. 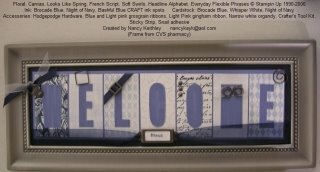 What a great card, thanks for sharing the instructions on how to make the shirt. Your are the bombalischous Toot queen!!! Did I already tell you that I LOVE YOU!! This is so cute!!! But can I ask a favor...please stop showing all these cool things with the Scor-pal thing!!! I don't have one!! Thank you so much for the pictures for this. I have tried making the folded shirt so many times and it never works out. The photos really help!! What an awesome idea! I think I just might have to case this!! What a super duper cute idea for a Father's Day card!! 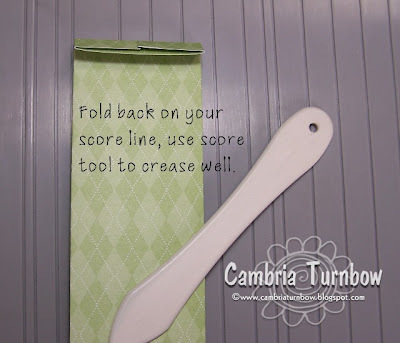 I don't have a Scor-pal (yet) but I may have to give it a try anyway with my old fashioned scoring blade on my paper trimmer. :-) Thanks so much for sharing the great tutorial! OMG! I LOVE this card! What a GREAT Father's Day Card! Awesome card. Gr8 colors. i think you have just inspired me to make this on my nephew's birthday card. Another wonderful visual tutorial - thank you so much! I saw Julie's card, too, and wanted to use the idea for a card for my grandson. I think I'll also make a card for my husband. I love your card. 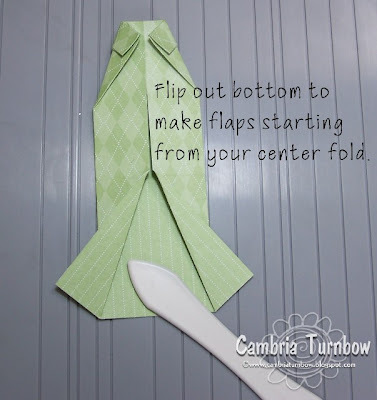 Thanks so much for this great tutorial will have to make one today. This is toooooo cute! I want to try this now! HOLY CAMIBOMB!! I fell out of my chair again! Thank you very much! What kind of friend are you! GEEZ! LOVE YOU CAMSTER!! You are my true blue! Love your card. And thanks for the great tutorial. Holy, moly -- there you go again . . . gotta try this! Thanks for the fantastic toot, girlie!! This card is fantastic!! Thanks for the tutorial -- your instructions are so easy to follow! What a nice card, thanks for sharing how to do the shirt. The instructions are excellent! Thanks, I'm sure you know you've been cited over at SCS! Great instructions! I just made it sitting here reading your blog. It will be on all three of my father's day cards this year! I love this!!! How cute, and the instructions and illustrations are easy to follow. If you ever teach a class here in the valley, let me know!!! You are the best! this looks so cute!!! LOVE THIS! How cute! LOVE the tie tack. Thank you for sharing this... a friend of mine showed me quickly and wrote the directions and had a beautiful one she made.... BUT, a few days later, I couldn't figure out what she did!!! I skipped the SCS challenge today because I hate reading directions on folding. Your pictures make it so much easier that I may now even attempt it. I love your paper choice. It's perfect and I don't think it looks girly at all. freaking AWESOME Cambria!!!!!!!!!!! GREAT colors! This is the most fantastic, adorable, fabulous, Father's Day shirt card EVER!! Wow! Thanks for sharing all the instructions, Cami!! You're the BEST! Jumpin' Jiminy!! What a fabulous toot, Cami! Not only is your card totally cool, but this shirt is beyond fun! Thank you, oh thank you! 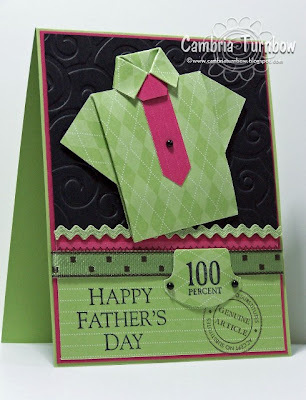 I don't like the Dad's day cards I have ready for my sons in law and I'm so thankful to get this tutorial on the reeeeeeally cute shirt card that (by the way) will be replacing the others I made!!! Thank you sooooooo much!! Cami, you rock! Look at you. Love your tutorials. Thanks for the tutorial. I made these a few years ago (before I got into stamping) for a luau I had, using hawaiian print material. Everyone loved the invites, but I lost the directions for folding of the shirt. You know I saved them this time!! You rock! Thanks so much for these visual instructions! There must be others like me who don't do well with written instructions! I might try this again! You are such a clever cookie! I adore this lil shirt! 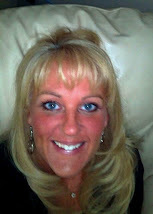 Just love reading your blog and getting so many wonderful ideas! ACK!!! Cambria.. I now have like 15 lil tiny shirts sitting on my desk. These are totally addicting. Your tutorial was awesome...the best one that I understood! Thank you! This was the most wonderful tutorial! I have made some of these shirts and I am so happy I found your site with the guide on here! Thank you thank you for helping me find something to put on cards for guys! Your tutorial is awesome! And I love the link to the one showing the shirt made from a $10 bill! Go glad I found your site! A freind turned me on to you and I am so thankful. You are incredible. I have been playing for days trying to figure Julie's shirt out! Then your post came and I liked yours and created shirts for my class tomorrow. Thank you so much! Your site rocks! I love your card and your tutorials are so so easy to follow! Thanks for sharing. P.S. Drooling over the Scor-pal - what a tool!!! I love your super easy to follow tutorial! I can't wait to make myself one of these cute little shirts!! YEAH YOU!!! 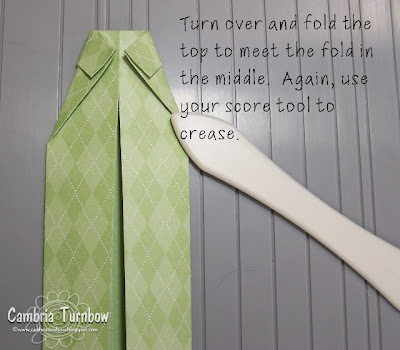 Finally a sweet *visual* tutorial on the shirt folding! I pulled my hair out 4 years ago using the dollar bill folds... yikes! 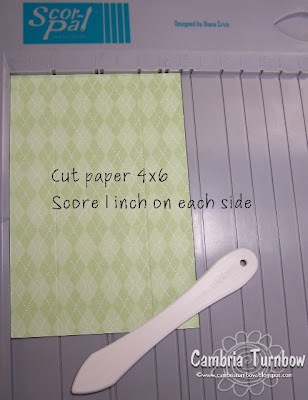 These are soo easy that I have now cased your card. thanks!!! Oh - and fun idea - have little kids draw on paper or color on paper and then fold their design into a shirt! I just love it when other people are so SMART!! I just made this shirt out of Au Chocolate paper and it is FABULOUS!! Thanks for the inspiration! I was ready to quit before I found these instructions on the folding! SUPER EASY! Thank you! This was so easy to follow and made a cute card for tomorrow. Absolutely LOVE it!!! Thanks for the fantastic directions. They were so easy to understand and also love the gift bag directions too. Made both of them today in such a short time. Thank you, thank you. thank you. thank u so much posting a tutorial, i had a very hard time making a shirt and i did try acouple of times. so i'm going to make one anyways even though father's day has pass. Forget Father's Day - it makes a good masculine card! I'd like if you can pass in my blog! If I hadn't already wanted a Scro-Pal's, this convinced me big time. Oh Oh Oh I did it!! I love your card and thanks so much for the great tutorial! Oh, I have wanted to learn how to do this! Thanks so much! You're directions were SO much easier than some of the other ones out there. Thank you for showing step by step! 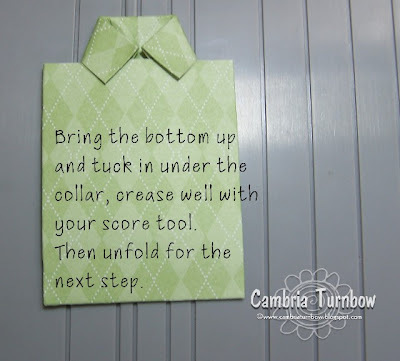 I love this card and the step by step directions are awesome. 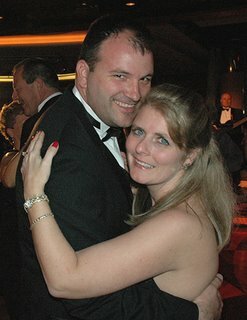 I know before I start making the card that it will be easy thanks to you. I can't wait to try other projects of yours. Here's the one I made! Thank you SO much for the awesome tutorial and I love my Scor-Pal, too! This is AWESOME! Thanks for the tutorial!! Yeah! I've just made my first origami shirt - thanks so much for your very clear instructions! Thank you for this wonderful pattern. I used these shirts for my son's church ordination and they were a HUGE hit! Janome Sew Mini On Sale! !